You said "Yes!" Now say YES to Krupp Florist for your wedding flower needs. Each bride has her own style and we strive to show that in your wedding flowers. From a lavish bridal bouquet to a simple rose corsage, all the details are attended to with the utmost care. No matter how great or simple your needs, we can assist you in planning that will easily fit your budget. To assist in our planning process please take the time to look through our photo gallery. You can also download our checklist to start making plans for your wedding flower dreams. When you are ready to meet fill out our Consultation Request Form, or call us at 618-233-8593 for an appointment. Krupp Florist will arrange a bouquet with your wishes in mind. We deliver your ceremony flowers to locations all over Belleville. 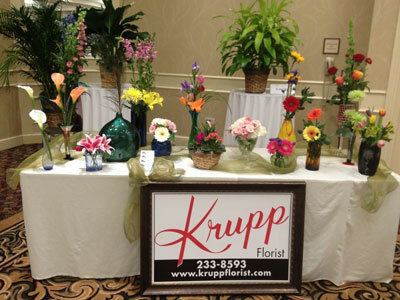 Your reception will be elegant with flowers from Krupp Florist. Our florists can design your flowers down to the last beautiful detail. Are you looking for the perfect place to have your wedding? Check out our list of Krupp-approved venues.